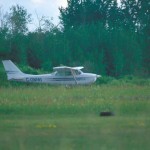 Five years ago today, on May 2, 2007, I became a Licensed Private Pilot! I can’t believe that I have been a pilot for 5 years!! I decided to celebrate the milestone by writing the story of my first flight lesson, which, even though it took place almost 7 years ago, I remember like it was yesterday – especially the moment when the wheels left the ground. But I’m getting ahead of myself. At the end of my last story, Life is too Short to be a Passenger, I announced to Jeff that I wanted to learn how to fly the airplane. I have never been one to just ‘go along for the ride’ in life…. That was 7 years ago, after Jeff took me flying in our airplane for the first time. Over the weeks that followed, Jeff and I talked about flying, and the adventures that we could take in our airplane. I knew that learning to fly would give me the knowledge and feeling of control that I would need to overcome my fears and truly enjoy our new lifestyle. But at that time, I was working between 60 and 70 hours a week. I didn’t have time to learn how to fly! A new possibility was emerging in my mind – the possibility of a very different life – one that did not include my high stress, senior management job. The fact that my 50th birthday was looming certainly came into play. My mother had died from breast cancer when she was 53. I knew I couldn’t learn how to fly AND continue with my current job, so I had to choose. It was a very difficult decision, and we spent hours going over finances and budgets. In the end, happiness won out! At the end of April, a few weeks after those first flights, I handed in my resignation at work, giving two months’ notice. My manager was shocked! I explained that the stress, the hours and the commute were too much and that I wanted to start enjoying life. “Besides”, I added, “we just bought an airplane and I’m going to learn to fly it”. As we all know, one of the ways to set and achieve a goal is to write it down. Without realizing it, I had done that, when, after my second flight, I had written in Jeff’s logbook “Since we own an airplane, I might as well learn how to fly it”. Well, that was one thing – a note in a logbook that a few people might see. My manager, however, took it much further than that! When she sent out the announcement about my resignation – to the entire company on the company’s internal communications portal (which goes to thousands of people), she stated that I was going to get my pilot’s license. Up until that point, I had no intention of getting my pilot’s license. I had thought that I would take a few lessons, learn how to land the airplane in case Jeff had a heart attack when we were flying, that sort of thing. But get my license? That sounded too difficult. I just wanted to fly! I didn’t want to study, write exams or take a flight test or anything as formal as that. I became an instant celebrity! People at work were stopping me in the hall and dropping by my office to congratulate me on my decision to become a pilot and to ask me all kinds of questions (which I had no answers for). And my staff and colleagues were proud to be associated with someone who was going to be a pilot. I was embarrassed, but I did not set them straight. I looked into the requirements for getting a pilot license and I discovered that there are different levels of licenses. I decided to go with the one called the Recreational Pilot License, as it required fewer hours of training and did not require me to attend ground school (a full Private Pilot License requires a minimum of 40 hours of ground school). The perfect solution to my situation! I would become a pilot with minimal effort! My last day of work was to be at the end of June and I was going to spend the summer dividing my time between the cottage and taking flying lessons. May and June were filled with wrapping things up at work and planning for the summer. 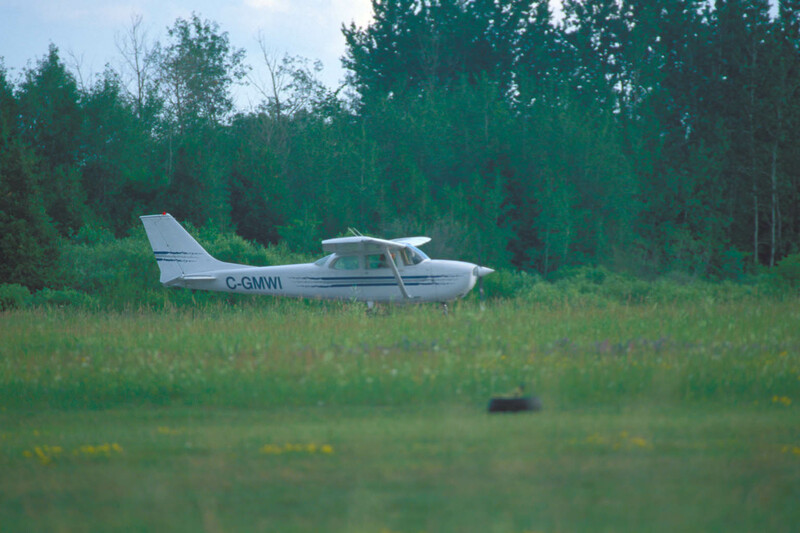 Near the end of June, we moved the airplane to the Lindsay Airport, which was closer to our cottage. We visited the flight school there and learned that they had just hired a new instructor – a female – and she would be joining the school before the end of June. Their ground school would be starting in July – did I want to sign up? “No, thank you”, I politely declined. Perfect – everything was lining up. Thursday June 30, 2005, was my last day of full-time work (the company had graciously offered to have me back, part-time, in a different role, after the end of September) and we went to the cottage for the long weekend. I had my first flight lesson booked for Monday July 4th, which was my 50th birthday! We awoke on that day to thick black clouds and a forecast for thunderstorms in the afternoon, which was when my lesson was supposed to take place. My instructor called to cancel and re-book for two days later. Very disappointing! It didn’t stop us from having a very nice birthday celebration, however, at the fanciest restaurant in Bobcaygeon! In no time, it was July 6th. As we drove to the airport, I could not contain my excitement. We met my instructor and she and Jeff chatted about her experience and then they talked – at length – about our airplane (I was going to use our airplane to learn to fly and she would normally use the flight schools’ airplanes). Hello – I’m over here – waiting for my flight lesson! Eventually, we got started. Her first question was “So, how is ground school going?” She knew darned well that I was not taking ground school – and the ground school had not even started yet. This was not a good sign. I reminded her that I was going for my Recreational License and would not be attending ground school. She nodded disapprovingly. Then she asked me if I had read the POH. The what? The POH, the Pilot Operating Handbook for the airplane. I dug it out of the flight bag and leafed through it. “You want me to read this?” I asked incredulously? Apparently, she did. I began to wonder what I had gotten myself into. I sat through a lecture about how to lean the mixture and how to calculate range and endurance. I wondered if I really needed to know any of this, but I did not comment – I just nodded as if I had some clue of what she was talking about. Finally, it was time to go flying! Then everything changed! As it turned out, this was her favourite part of the lesson, too! After showing me how to do the pre-flight inspection, we got into the airplane. This was my first time sitting in the pilot’s seat (the left seat) where I would be sitting for all of my flight lessons. She walked me through the pre-start and the start-up checklists and we got the engine started. She showed me how to taxi, which is done using the rudder pedals (and much more difficult than I expected), not the control yoke. And then we were at the runway. She announced our intentions to other airplanes in the area and taxied onto the runway. Putting her hand lightly on mine, she guided me to smoothly apply full throttle and as we reached 55 knots, she helped me pull back gently on the control yoke and we were airborne! It was an amazing feeling to know that I was controlling the airplane! I still get the same thrill every time I take off! We climbed out over the beautiful countryside, over farmers’ fields and lakes. By this time, it was early evening and the air was smooth. It was a bit hazy, so there wasn’t a well-defined horizon. That made it a bit difficult to fly straight and level, but my instructor was pleased with my ability to handle the airplane. I had been flying with Jeff for the past two or three months, so I was used to the movement of the airplane and most of her students did not have as much time in a small airplane as I had. She decided to move on to turns and she was impressed with my lack of hesitation to bank the airplane – again, because I had experienced this during my flights with Jeff. All too soon, it was time to return to the airport. The instructor landed the airplane – it would be another few lessons before I would be allowed to do that. After we stopped the engine and I got out of the airplane, I was literally jumping up and down with excitement. I then knew what I have never doubted since. No matter how many manuals I had to read, or how many lessons I had to take, I was going to be a pilot! I think I would like to take lessons also!!! Gladys, I’m happy that my story inspired you. My future stories will describe some of the ups and downs (pun intended) of learning to fly.